Video clip synopsis – By the early 1960s, it was clear that Indigenous people were not being assimilated — discrimination against Indigenous people continued and many Indigenous people refused to surrender their culture and lifestyle. The assimilation policy had failed. Broadband MP4 bonncha_bb.mp4 (4.4MB), suitable for iPods and computer downloads. Neville Bonner – Change is an excerpt from the program Neville Bonner (26 mins), an episode of Australian Biography Series 1 (7×26 mins), produced in 1991. Neville Bonner: Born in northern NSW in 1922, Neville Bonner started his working life as a ringbarker, canecutter and stockman. He was the first Aboriginal person in Federal Parliament, representing Queensland as a Liberal Party Senator from 1971 to 1983. Employment and education were central to government attempts to ‘merge’ Indigenous people, particularly children, into non-Indigenous society. During the 1920s, state and territory governments opened schools and training institutions. Indigenous children were also sent to missions run by church groups. Young women were often recruited to work as domestics for non-Indigenous households. 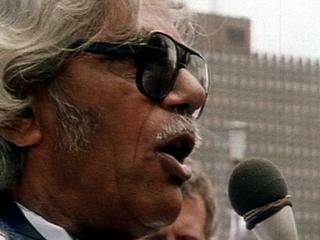 Campaigners such as Neville Bonner argued in favour of a policy of self-determination. The right to self-determination has underpinned many social justice concerns of Indigenous Australians. Self-determination is the right of all peoples to freely determine their political status and freely pursue their economic, social and cultural development in a way that meets their needs. The principle is a fundamental human right under international law and is included in the UN Charter of 1945, as well as other important international instruments such as the International Covenant on Civil and Political Rights (Article 1). Indigenous peoples, as a specific form of exercising their right to self-determination, have the right to autonomy or self-government in matters relating to their internal and local affairs, including culture, religion, education, information, media, health, housing, employment, social welfare, economic activities, land and resources management, environment and entry by non-members, as well as ways and means for financing these autonomous functions. Define the problems that Neville Bonner identifies concerning decision-making on issues affecting the Aboriginal community. What kinds of solutions does he suggest? Do you think those solutions are workable? Describe your reaction to the camera shots of the NSW Aboriginal settlement filmed in 1967. What issues of importance do you think Neville Bonner would identify from those scenes? Comment on the purpose of the background sound effects accompanying the scenes. Comment on the message Neville Bonner is delivering while filmed at a rally. Who is the message aimed at? Who is he appealing to? Where do you think this rally is taking place, and how can you tell? Carry out research then present an illustrated two-page magazine spread, in desktop publishing format, about Neville Bonner’s controversial political career. Your work should contain an assessment of his political achievements, and the reasons for why his parliamentary career ended. Neville Bonner is an example of an Indigenous Australian who worked for his people through the existing political structure of parliament and law-making. In pairs research an alternative means of campaigning for Indigenous rights, the Aboriginal Tent Embassy, which was set up in 1972, one year after Neville entered federal parliament. Present a poster display of the history of the Tent Embassy and its leaders, supporters and critics, looking at its aims, its legality, its achievements and failings, the way it was represented in the national media, and its possible legacy today. Debate in class: should the Aboriginal population be allotted a specific number of seats in every federal, state and territory parliament, or should Aboriginal candidates stand for election in the usual way, against other, non-Indigenous candidates?